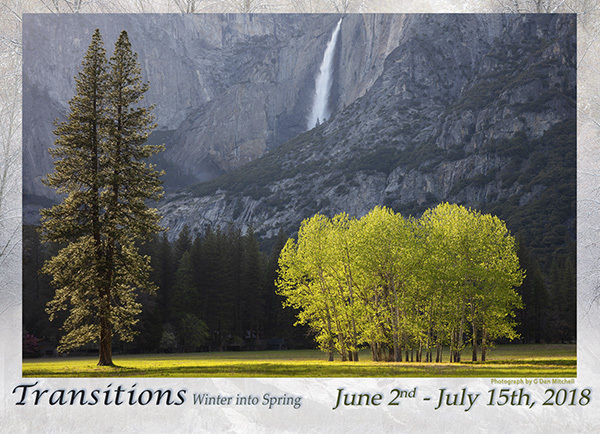 Transitions - Winter into Spring has been extended through July 31st! There is still time to view this exceptional exhibit by 2018 Yosemite artist in residence G Dan Mitchell and friends. Opening on June 2nd at Gallery 5 in Oakhurst, artist's reception on June 9th from 5 to 8 pm. We are very excited to present a special exhibit featuring works by 2018 artist in residence G Dan Mitchell and friends. Over the past two months, artist in residence G Dan Mitchell has been photographing Yosemite during the transition from winter into spring. It is an unpredictable time, rich in imagery for photographers as late winter storms challenge the new growth of spring. Wildflowers appear first, poppies and many others. Dogwoods come next, encouraged by warming temperatures and clearing snow. At the same time temperatures suddenly drop and snow falls in unpredictable ways. Daffodils and irises are suddenly covered in snow. G Dan and six other photographers have done their best to capture this magical time in and around Yosemite. The show will include over 40 works documenting the transition. Proceeds from the exhibit will benefit Yosemite Renaissance. Please join us!